Groundnuts are rich in monounsaturated fatty acids which help in the reduction of bad cholesterol in the body. In addition to this, groundnuts are also a good source of niacin, folate, vitamin E, protein and the mineral manganese. Try this delicious recipe of groundnut chutney which goes famously well with dosa, idli and even chapatti. Fry the peanuts on a low to medium flame for 3-4 minutes. Add the curry leaves and fry for a minute. Lastly add the roasted chana dal, sesame seeds & asafoetida and fry for 2-3 minutes more on a low flame. Take care that you don’t over brown or burn this mixture, else the chutney might have bitter tones. Let this mixture warm or cool down. Add in a chutney grinder or a small blender. Add the ginger, green chilies, and salt. 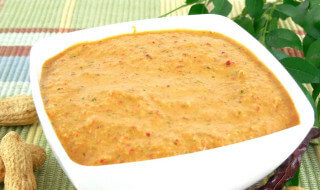 Pour some water and grind the peanut chutney to a smooth consistency. You can make the peanut chutney thick or of medium consistency.